Emcees Goyo, husband Tostao, and brother Slow claim Colombia’s oft-overlooked Pacific coast as home and their positive energy easily translates to themes of greater unity on Oro, the trio’s U.S. debut. Synthesizing two releases, from 2007 and 2009, that are available only in their native nation, Oro incorporates many styles, demonstrating the dexterity of this trio — not to mention the excellent production from honorary Colombian Richard Blair (of Sidestepper) and Ivan Benevides. Just crank the dubby first single “De Donde Vengo Yo” and these well-seasoned emcees reveal a hidden Colombian rhythm. The dance-floor bangers of cumbia are traded in for the funky raga behind Goyo’s velvety smooth delivery on “Alguien Como Tu” and the spitfire rhymes of the piano-driven “Pescao Envenenao”. 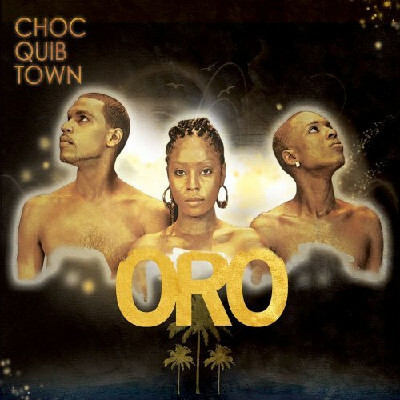 Choc Quib Town champions a localized sound layered with global influences, and Oro, like golden honey, hits a sweet spot. After the jump, check out the video for “De Donde Vengo Yo”.